Shortly after Naruto was born, his father, the Fourth Hokage, sealed the dangerous Nine-Tailed Demon Fox within Naruto's body at the cost of his own life, leaving Naruto without a family. As a result of him being the demon fox's host, the villagers of Konoha hold a strong animosity for Naruto. Thus, he never has a source of love or attention during his early childhood. Desiring what he lacks in his early life, Naruto dreams of becoming Hokage, the village's leader, hoping that it will bring him the villagers' recognition and respect. To assist him in gaining this title, Naruto possesses a fierce determination, always confident he can complete a given task with relative ease. Although he does not always complete his tasks, Naruto's efforts prove successful as the series progresses; many characters reach the conclusion that Naruto will someday be an excellent Hokage. Since his childhood, Naruto has commonly made jokes to attract attention. He sometimes goes to the point of transforming into a naked woman to ridicule whoever may be bothering him. This even causes his pupil, Konohamaru Sarutobi, to emulate his techniques and jokes. 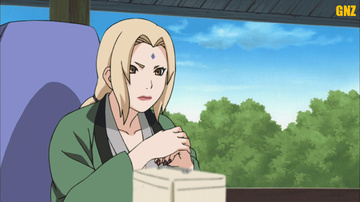 Occasionally, Naruto's determination results in those around him adopting some of his traits, such that in Part II his teacher, Kakashi Hatake, notes this to be Naruto's unique power. In the aftermath of fighting Naruto, Gaara discovers that true strength is found in fighting for one's friends, not for oneself. These character metamorphoses serve as the moral for the arcs they take place in, and subsequently become the creed for the particular character's life. After Jiraiya's death, Naruto becomes determinated to kill Pain, Jiraiya's murderer. However, he later decides not to kill Pain and that he will break the hatred's cycle as Jiraiya wanted. Through his ability to change others, Naruto gains the friends he lacks during his childhood. Among the many friendships he forms, none are more prominent in the series than those he has with his two teammates: Sasuke Uchiha and Sakura Haruno. With Sasuke, Naruto shares a highly competitive relationship which he likens to brotherhood. Though Sasuke betrays Naruto and the rest of Konoha at the end of Part I, Naruto maintains his attachment to Sasuke, readily lashing out at anyone who speaks poorly of him. Naruto possesses a deep dedication to Sakura, rooted in the crush he has had on her for years. Naruto's commitment to Sakura is so strong that he will do anything to make her happy, vowing to someday return Sasuke to Konoha for her sake. Because of the demon fox sealed within him, Naruto has access to its great reserves of chakra, a form of energy which allows ninja to perform supernatural feats. This surplus of chakra allows him to perform ninja abilities that someone of his age would ordinarily be incapable of using. Though portions of the fox's chakra constantly mix with Naruto's own, Naruto can forcibly draw upon its reserves by either submitting to rage or by directly asking the fox for a donation of its strength. Once the demon fox chakra releases, a fox-shaped shroud envelops Naruto, with the number of tails, ranging from one to nine, indicating its current state of release. While each tail drastically increases his fighting strength, Naruto begins to lose his rationality as more tails appear, completely losing himself once the fourth tail appears. Because the demon fox's power can quickly become a danger to those he cares for, Naruto attempts to limit his reliance on and usage of the power. Naruto takes advantage of his expanded chakra reserves throughout the series. His first and most recurring example of this is the Shadow Clone Technique, which creates any number of physical copies of the user, but requires large amounts of chakra. Though most ninjas can create only a few shadow clones, Naruto's vast chakra allows him to create hundreds of clones at once without worrying about fatigue. He finds a number of uses for these clones, among them overwhelming opponents, scouting large areas, and training in a short period of time. His ability to summon toads to aid him in battle relies on the fox's chakra, since he can only summon larger toads with the fox's help. He also learns senjutsu, a power-enhancing ability derived from frogs and involving the gathering of natural energy. Naruto favors the Rasengan, a concentrated ball of spinning chakra first created by his father. When performing the technique, Naruto creates shadow clones to help him manipulate the chakra into its proper shape. While capable of grinding into whatever it touches and causing great damage, Minato created the Rasengan with the intention of infusing it with his own elemental chakra. Through repeated training with his shadow clones, Naruto infuses the Rasengan with his own wind chakra. This results in the creation of the Wind Style: Rasenshuriken, which damages anything it impacts on a devastating scale but, when first used, also injures Naruto's arm to a lesser extent. Through his sage training and mastery of Senjutsu, Naruto solves this problem by learning to throw the Rasenshuriken at his targets rather than ramming it into them.